Soap is fragrance and color free. Felted soap with swirling colors of fiber presented over a small rounded cake of soap that is fragrance and color free. 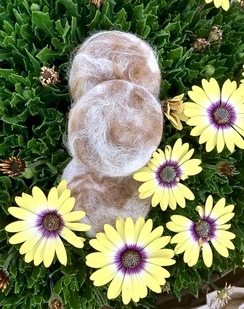 The felted fiber felts more with each use. The fiber acts like a washcloth, dries between uses and is a fun way to get clean.